See also our stock of Freedom Arms revolvers. We are happy to announce that Precise Shooter is a Freedom Arms dealer, which allows us to offer you the best of the best of revolvers at the lowest possible prices. Freedom Arms is a custom shop in the truest sense of the world. The factory produces only a few guns per week - but not for the lack of interest, so if you want something that we do not have in stock, allow up to 25 weeks for your order to ship! In return for the wait you will be getting a revolver that is not only exquisite in craftsmanship, but is also amazingly accurate. Here is a load development target shot at 25 yards. Freedom arms produces several types of revolvers. The flagship product is Model 83, which is available in calibers .500 Wyoming Express, .475 Linebaugh, .454 Casull, .44 Remington Magnum, .41 Remington Magnum, and .357 Magnum. .454 Casull is "Freedom Arms native" - it built the first commercial revolver in this caliber, and the revolver was specifically designed for it. Model 83 is available in two "trims" - Field grade and Premier grade. Internally they are identical. The Premier grade has, in Firefly terms, a "shinier" polish and a lifetime warranty to the original owner. The Field grade has a matte finish and one year long warranty. The difference in finish is so slight that it would be hard to tell on a photograph. All calibers except .357 Magnum and .500 Wyoming Express are available with 4 3/4", 6", 7 1/2", and 10" barrels. The longest barrel on 500WE is 7 1/2", and the longest barrel on 357Mag is 9". 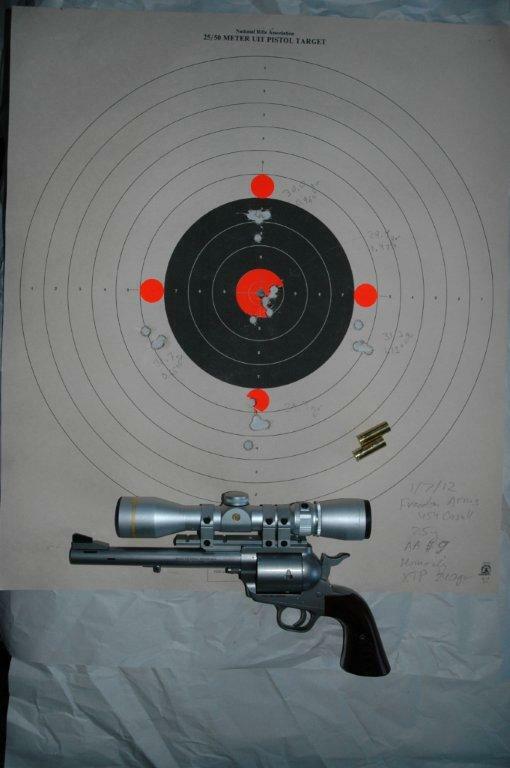 A Model 83 revolver is perfect for hunting, target shooting, showing off at the range (if you are a skillful shooter, that is), or just contemplating its beauty in awe. In addition to the above calibers, Freedom Arms has a .22 Silhouette Revolver built on the base of Model 83 specifically for Silhouette competition. The second major Freedom Arms revolver type is Model 97. It is a lighter version of 83, and is designed for smaller calibers: .357 Magnum, 327 Federal, 224-32 FA, .22LR and .17 HMR. Model 97 is only available in Premier grade trim, with the shiny finish and the lifetime warranty to the original owner. Please note that we DO NOT take credit cards as a payment option on Freedom Arms special order (only) revolvers. Our margins are very, very small, as you can see from the prices below, and wait times are very, very long, which means that personal/certified check for these revolvers is a very viable and economical form of payment. We do take credit cards for our in-stock Freedom Arms guns. Please note that these revolvers are custom-built by the manufacturer and have to be ordered from the factory. We will gladly help get one (or more!) built just for you! Please email us at sales@preciseshooter.com to start the process. The shipping will be exactly the cost of USPS fully insured priority mail, usually between $40 and $50. Please see here for details. Stainless Steel, Brush Finish and Impregnated Hardwood Grips. Adjustable sight models are drilled and tapped for scope mounts. Stainless Steel, Brush Finish and Impregnated Hardwood Grips. Stainless Steel, Matte Finish, and Impregnated Hardwood Grips. Note: The .22 LR Match chambers are made to more precise dimensions than the .22 LR Sporting chambers, generally giving slightly tighter groups. Some ammunition may require hand seating with a wood dowel in the Match chambers due to the precision of the Match chamber. All Silhouette models listed include competition rear sight, adjustable front sight, front sight hood, and trigger over travel screw. The following options apply to both the Model 83 and 97 revolvers unless otherwise specified and only to new revolver orders. Rimfire Model 83 5 1/8" Min., 10" Max. (*) Note: This short barrel length requires the ejector tube to be removed in order to remove cylinder for cleaning due to physical lengths. Receiver drilled and tapped for scope base, no front sight base, front sight, or rear sight. Optional sights factory installed in place of standard sights. Scope and RDS mounts. Fit adjustable sight models only. Include part item numbers 3, 4 (3ea), 7, 13, 18, 52, 53, 70 (consult Instruction Manual).